1. Reconnect to simplicity. Eating simple meals, & for entertainment watching the sunset & moon rise. 2. Remind myself of what’s important. 4. Release to the earth my fear and worries. 5. Replenish my spirit by washing away any hurts that have hung on. What sets apart one retreat from another are: accommodations and food. Tuscany offers you a beautiful experience in living like Italians do. Seek the best. There is no reason you have to share a bathroom with 5-10 other guests. We are experts in Tuscany. 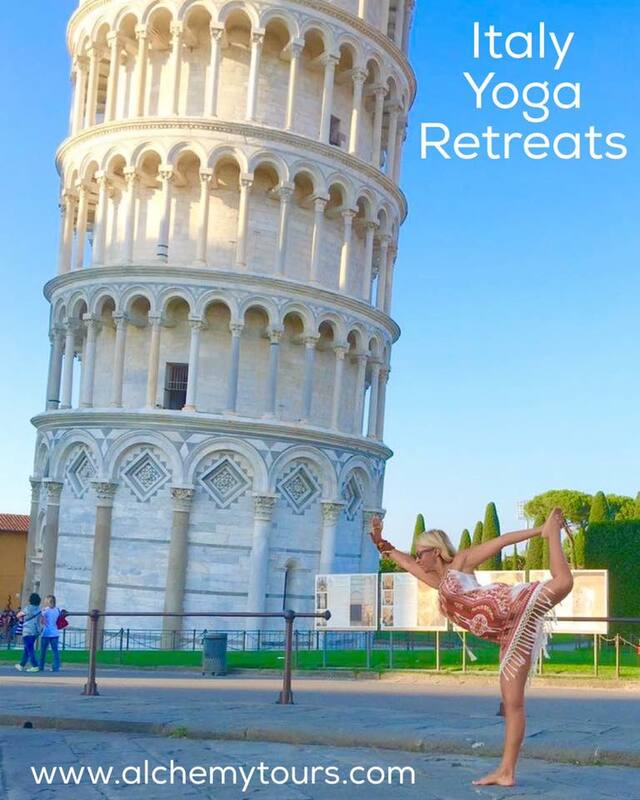 We will be guests at Antico Borgo di Tignano, a UNESCO World Heritage site and classic Tuscan farmhouse which our friend, Gabriella has converted into a stylish yoga retreat center. Gabriella guided a team of architects and licensed contractors to renovate this medieval village and now you get to see the completion of her vision. With epic views of Casole d’Elsa and Volterra in the distance, this is the perfect entryway into the Tuscan countryside. The actual Borgo was a 16th century rural residence. Its original name, Borgo di Tignano, has Roman origins. It is the probable birth-place, in the 4th century, of Saint Attinia, a venerated saint from the Volterra area. Amongst its illustrious guests in the 1800’s, during the time the Borgo was a summer retreat from the ‘Scolopi‘ fathers, was Pope Pius the ninth. This Borgo is overall a place to enjoy with your heart, surrounded by a soft landscape and a peculiar light which often brings back forgotten emotions. In the local tradition, one says that the Berignone Forest, which faces the Borgo, is what inspired Dante Alighieri to write about the “Selva Oscura”–the location in which his Divine Comedy story starts. The gardens of the Borgo, with lavendar-lined paths combine with aromatic herbs, juniper hedges, myrtle and evergreens to reproduce a Mediterranean environment. The characteristic ‘Osteria’, which used to be the old olive press, is the ideal place for a romantic candlelight dinner overlooking the amazing countryside, or a light lunch on the panoramic terrace. A beautiful, large swimming pool and lounge area welcome you to get the most out of the sun. There is a reading room that also has a wireless internet point. There is a golf course within 30 minutes drive from the Borgo. Accommodation is in one bedroom apartments with private baths and kitchens. All the apartments are independent, personalized and fully furnished, with ample garden and terrace areas for leisure. $200 OFF for Sun Lovers, Beach Afficianados: The Perfect Summer Vacation! Ciao Sun Lovers & Beach Goers! Then this means you’re beach lovers like us. You should know we’re also both Water signs so wearing shoes generally feels over-dressed. Pack some swimsuits, and let’s adventure in barefeet together on the Amalfi Coast July 1-7th living on Ischia! Salute the SUN for REAL! *PS Photos are of Ischia! We will be guests at a classic Tuscan farmhouse converted into a stylish yoga retreat, Gabriella’s Borgo which is located in Tignano, a recently renovated medieval village, close to Casole d’Elsa and Volterra, in the Tuscan countryside. The wonderful host, Gabriella, will charm and welcome you at arrival as if seeing an old friend again. The actual Borgo used to be a rural residence dating back to the 16th century. Its original name, Borgo di Tignano, has Roman origins. It is the probable birth-place, in the 4th century, of Saint Attinia, a venerated saint from the Volterra area. Amongst its illustrious guests in the 1800’s, during the time the Borgo was a summer retreat from the ‘Scolopi‘ fathers, was Pope Pius the ninth. This Borgo is overall a place to enjoy with your heart, surrounded by a soft landscape and a peculiar light which brings back forgotten emotions of interior freedom. It’s also a place, where one can experience a genuine Tuscany, with its tradition and land culture. In the local tradition, one says that the Berignone Forest, facing the Borgo, is the one that inspired Dante Alighieri to write about the “Selva Oscura” where his Divine Comedy story starts. The gardens of the Borgo, with paths lined with aromatic herbs, juniper hedges, myrtle and evergreens, reproduce a Mediterranean environment. The characteristic ‘Osteria’, which used to be the old olive press, is the ideal place for a romantic candlelight dinner overlooking the amazing countryside, or a light lunch on the panoramic terrace. The swimming pool is available during the warm months (May through September) and it is 16 x 8 meters large. There is a reading room that also has a wireless internet point. There is a golf course within 30 minutes drive from the Borgo. Accommodation is in apartments with one, two or three bedrooms; all bedrooms have private bath. All the apartments are independent, personalized and fully furnished, with ample garden and terrace areas for leisure. The perfume of flowers and plants surround the swimming pool. There is beauty all around!